Nehemiah was an official in the Persian court, serving under King Artaxerxes as his cupbearer. Cupbearing is a job unique to households with important people – previously I’ve looked at the Chief Cupbearer of the Pharaoh during Joseph’s time, and pondered on how this position is one that is extremely intimate to the King [Genesis 41:9|Article]. What do they do? They bear the cups of the King, they test their wine – they are people whom the King must trust. As a cupbearer to Artaxerxes, Nehemiah made a request – to rebuild the walls of Jerusalem – and the King granted him the request, appointing him governor of Judah and tasking him with the mission itself. The book of Nehemiah is thus a record of Nehemiah’s journey of rebuilding Jerusalem and dedicating the city and its people to God. The book of Nehemiah reads like any good old adventure story, with this and that happening, but despite the opposition, the wall was eventually completed in chapter 6. In Nehemiah 8, the law was read for the first time in those days. Much like an opening ceremony, just a godly version where they dedicated the city to God. It must have been a heartwarming moment for the Jews. Nehemiah 8:10 is perhaps one of the more familiar verses in the book of Nehemiah, yet often we use it without knowing how rich a verse it is in its original context. In today’s study, we will examine this verse bit by bit while drawing a connection to the context and the background of the verse. Do not grieve, for the joy of the Lord is your strength – Grieve? Why grieve? At first glance, this verse seems to be one of joy – and while that is certainly true: this verse does indeed speak of great joy – the background of this verse was one of grief. The wall of Jerusalem was finally completed – the Jews were gathered, Ezra was and the Levites were reading from the Book of the Law in a way that the people could understand – They read from the Book of the Law of God, making it clear and giving the meaning so that the people could understand what was being read [Neh 8:8] – it was rare for them at that time to have such access to the Law. And the people were crying as they listened to it – For all the people had been weeping as they listened to the words of the Law [Neh 8:9].Why were they crying? Why were they grieving? I wonder – perhaps it was a heartwarming moment – the wall was finally rebuilt, and the people could finally listen to the Law. Perhaps it was a heart-wrenching moment – they had finally rebuilt the wall, they could finally listen to the Law, but it was a moment when the impact of what the Law means would have struck them. The Law, which they haven’t been keeping, and to God, whose wrath and judgement they now know they face as a result of their disobedience and sinfulness. “Do not grieve,” Nehemiah urged. “Do not mourn or weep.” [Neh 8:9] Reading and listening to the word of God should be something that fills us with joy, with hope, with strength. If we would only learn to look to God as a source of our joy, as the source of our joy, we would be filled with exceeding joy [Psalm 43:4|Article]. If we would look to God as our shelter and our refuge, we will find rest [Psalm 62:5] and regain our vigour and strength [Psalm 46:1]. This day is holy to our Lord – repeats Nehemiah in verses 9 and 10. By all accounts it was to be a special day. If you have a new shop and today is the opening ceremony of your shop, today will be a special day for you. If you’re getting married today, today will be a special day for you and your spouse. If a new country gains its independence today, today will be a special day for its citizens. By all means, it was to be a special day, and as it was a day in which they’ve set themselves aside to specially dedicate the city – and its people, themselves – to the Lord, by all accounts, it has got to be a day that’s holier than the norm. Perhaps you subscribe to the idea that every day is a special day, every day is a holy day to our Lord. And perhaps you are right. But just in terms of its significance, surely it was a very special day to the Jews. And since it was such a special and holy day, why spoil the festival by mourning and grieving and weeping? Celebrate! Enjoy! Give thanks! It is a holy day – and that alone is reason enough to celebrate. Go and enjoy choice food and sweet drinks – And they celebrate as we do today – with food and wine. This is a verse that is often quoted in times of merry-making, with the idea that it is in God’s intention that we gain pleasure through food. I’m not going to argue that, but I just want to look a bit deeper into the context of this verse and why, of all times, Nehemiah chose to say something like this immediately after the Book of Law was read. It was a festival – much like an opening ceremony. It was a special day, and a day when they were allowed to pamper themselves with good food and drinks, things that they do not usually get to enjoy. In the background context of saying this, Nehemiah and the people had just went through a very emotional moment as they listened to the Book of the Law and grieved over their national sins. They were asked to enjoy their good food at a time when they were closer to God then ever – at a time when they have finally turned back to God after a period of time. 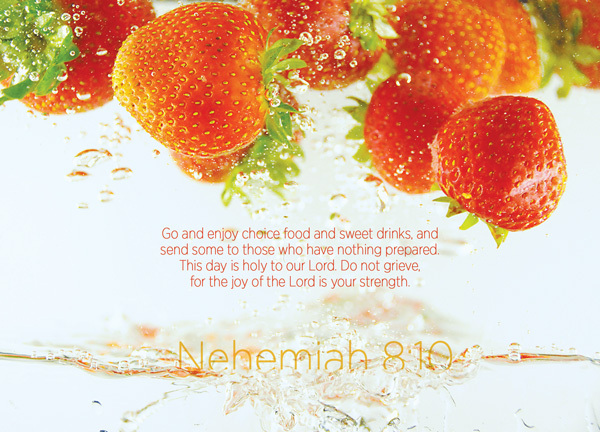 That each of them may eat and drink, and find satisfaction in all their toil—this is the gift of God [Ecc 3:13] – it is not wrong to say that it is in God’s intention that we gain pleasure through food – but Nehemiah 8:10 especially has great connotations on enjoying ourselves without forgetting that it is the Lord who had given us all these. Next time you feast and make merry, why not quote this verse in a new perspective? Use it not as an excuse to merry-make – you do not need an excuse, but meditate upon it with thanksgiving and joy. send some to those who have nothing prepared – Nehemiah’s compassion for the poor was consistent throughout the book – Chapter 5 especially notes the actions taken by Nehemiah to aid the poor. On a day like this when the people faced their past sins collectively as a nation, and returned to God and listened to the word of God collectively as a people, it was also time for them to celebrate and feast collectively as one. When we feast, do we invite those who have nothing prepared as well – nothing to contribute, not just in terms of food and money? Or do we simply enjoy our choice food and sweet drinks amongst those who already have choice food and sweet drinks? Nehemiah 8 recounts an emotional time for the Jews. A special day, a day when they listened to the word of the Lord for the first time perhaps in their lives – I don’t know; a day when they repented collectively as one and returned to the Lord. A day when they were asked to forget about the past sins and troubles but set their eyes on God instead. A day when they were told to enjoy themselves with food. A day that ended in joy. We will likely never ever have the opportunity to apply this verse in such an emotional moment like Nehemiah did, but the next time we celebrate something, the next time we feast and merry-make, let us not forget the word of God, let us not forget to give thanks to God, and let us feast with joy and thanksgiving.